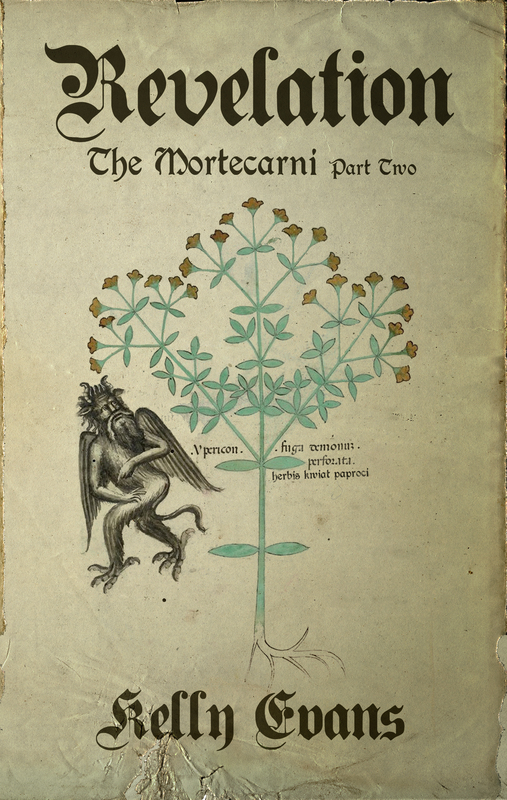 Revelation: The Mortecarni Part Two will be released in June 2018. The interior of the church was dark; the years of grime prevented much of the outside light from shining in. It was like any other lesser church and more than likely served a small community nearby. Looking around in the gloom, I could see the altar at the front, but also signs of a struggle. The cloth had been torn from the altar and was lying in shreds on the floor in front. Candlesticks and crucifixes also lay scattered, and my heart nearly stopped as I saw the communion plate broken in pieces on the floor. I took a step toward the front of the church when Hugh’s arm stopped me. He pointed to the corner of the room, to the right of the altar. We weren’t alone. Judging by the robes and cowl, here was another monk, kneeling in prayer, his hands hidden inside his wide sleeves. We’d been so quiet when we’d arrived that he’d obviously not heard us, so focussed on his prayers was he. I looked at Fala, who just shrugged. I looked back at Hugh and Fala, who stood in place, watching the exchange. They were both frowning and Hugh nodded to urge me forward. I turned and approached the man, who still hadn’t moved. “Brother?” The stench hit me when I was less than a foot from the monk, and I wondered that we hadn’t smelled it upon entering the church. Horrified, I stepped back and soon had my sword in my hand. Raising it, I used the tip to carefully move the man’s cowl from his face. At first the monk, for surely by the clothing this must have been another man of God, remained staring forward. I could see his tonsure, much like my own hair, running just above his ear, and his beardless face. Then he turned his head to look at me and I staggered back at the sight. What should have been the right side of his face was instead a raw, gaping hole. The entire half of his head was missing, with jagged edges of flesh outlining where the missing part used to be. His eyeball was still held firm by his socket but, beyond that, there was only exposed tendons, muscles, a tongue that had begun to swell and bulge from the gap, and bits of cracked skull fragments embedded in the white flesh of his brain. Hugh and Fala had both seen me recoil and came forward, swords ready. I waved my hand; there was something odd about this situation. Why wasn’t the creature rising? Growling? Attacking? I took another step toward it, still with my sword prepared, but all the mortecarni did was raise a bloodied arm at me in a feeble attempt at a strike. It then returned to its original position, staring forward, kneeling, hands folded back into the sleeves. A thought came to me, like a flash of lightening. No, it couldn’t be. I shook my head, what a time to entertain such nonsense! Raising my arm, I brought my sword down across the creature’s neck, watching as the body dropped into the folds of the brown robe that had hidden the beast. Collapsing against one of the benches, I looked around for something with which to wipe my blade. A piece of linen, torn from a dress or sleeve, lay on the ground and this I put to use while Hugh and Fala watched. Without a word Hugh wrapped the body in its own robes, and, together with Fala, dragged it out the door and away from the church. Rising from the bench, I followed them, stopping in the church yard. “Wait.” They turned. “Over there.” I pointed. Their eyes followed the direction of my arm. “But, it, he…” Hugh stopped, the frown on his forehead visible from where I stood. Expressing my sudden emotions so vocally had exhausted me, but my words reached Fala and Hugh. They picked up the body and carried it to the side of the church where others had been buried. Choosing a spot, Hugh and Fala took turns digging a hole, using their hands and a piece of wood found nearby. When the hole was deep enough, and the body had been placed inside, I said a prayer, asking God to please allow this soul to enter His Divine realm. When we were done, none of us could bear the thought of eating within the church. The horses had had a rest, the intended consequence of this stop, so we continued on our way. I kept what I’d thought I’d witnessed in the church to myself, but my silence soon encouraged sideways glances as we continued on our ride, and finally comment. “You’re very quiet, Maurice. Are you unwell?” Fala’s eyebrows were knit in concern. I shook my head. “No, just remembering my monastery.” It was true, I had been recalling past days when I was a novice. Perhaps the mortecarni’s robe had reminded me of something from my youth. “Destroying that creature must have been difficult for you.” Hugh’s voice was soft. The truth was, the monk-creature HAD disturbed me, but not for the reasons my friends suspected. It was not because I felt that I was killing another like me, no, for what I’d said to Hugh was true. But the creature hadn’t attacked us. In fact, it appeared to me more interested in remaining quietly where it was than searching for flesh. Surely this was madness! I hadn’t travelled like this for quite some time, perhaps I was just tired. I looked over at Hugh and Fala, and saw they were now laughing over some comment, and decided to try to retire early this evening, for I was now convinced my mind required repose to set it right. We had only a few more days of travel before we arrived at our destination, and I was hopeful we would find the answers we sought.